Answer “yes” to any of these questions and we think Stabil-Dent lower denture stabilizers will benefit you. Frustrated with repeated trips to the dentist only to find yourself dealing with the same loose lower denture issue? Using more & more denture adhesive with no results? Having trouble speaking because your lower denture flips up? Getting food trapped under your lower denture? Having your lower denture pop out of your mouth? Been told that you need to accept your situation? Tried everything to secure your lower denture but have had little to no success? Been advised by your dentist that you need dental implants costing $2,500-$7,500? 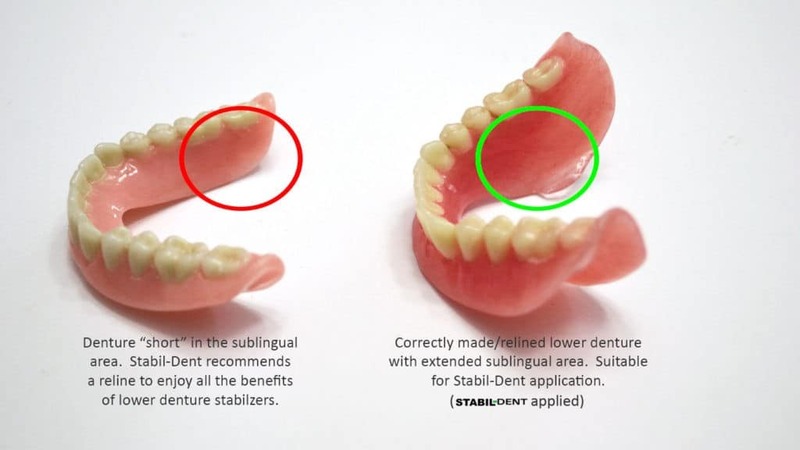 Stabil-Dent’s patented design is extremely effective but we want you to get the most from Stabil-Dent. Please compare your lower denture with the pictures below. If your lower denture looks similar to the denture on the right you will experience all the benefits from the application of Stabil-Dent. 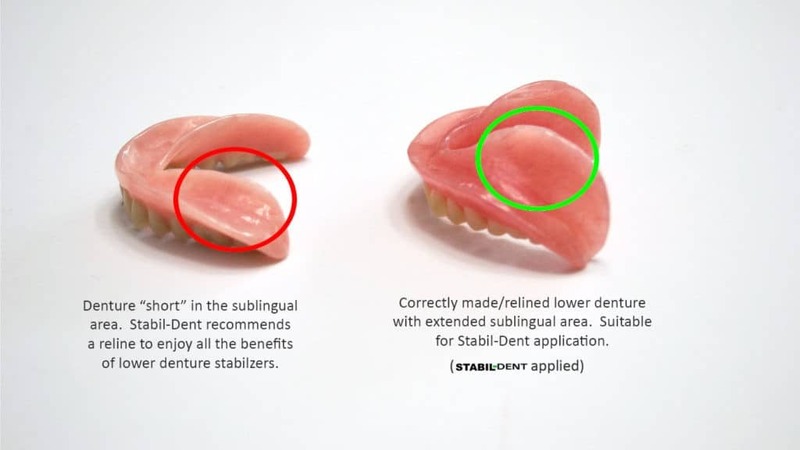 If your denture looks like the denture on the left we suggest a clinical reline to extend the sublingual area before applying Stabil-Dent too enjoy all of its’ benefits. A clinical reline and Stabil-Dent are a powerful combination that will free you from adhesives (or greatly reduce the need for them), greatly improve the comfort of your lower denture, improve your speech and allow you to eat the foods you’ve had to give up. You can also try this simple test to see if you would benefit from a reline on your lower denture before applying Stabil-Dent. Place the tip of your tongue on the tongue side of the last back tooth. Slide the tip of your tongue down towards the floor of our mouth. Can your tongue go under the edge of you lower denture? We strongly suggest having a clinical reline performed as other types are usually a waste of time and money. See our explainer page on relines for more information.